The Association for the Advancement of Medical Instrumentation (AAMI) partners wih MediSend International. "This is an extraordinary opportunity to offer AAMI’s standards, policies, resources, and educational opportunities to healthcare systems struggling to improve. "says Nick Hallack, President and CEO of MediSend International. AAMI and MediSend International are teaming up through a Memorandum of Understanding to help promote medical device standards and increase educational opportunities in developing countries around the world. "There is a critical lack of biomedical standards and policies in developing country healthcare systems," says Nick Hallack, president and chief executive officer of MediSend, a U.S.-nonprofit humanitarian organization that seeks to transform hospitals in developing countries through the training and education of qualified biomedical technicians, the design and deployment of biomedical test and repair kits, and the distribution of medical supplies and biomedical equipment. "This is an extraordinary opportunity to offer AAMI’s standards, policies, resources, and educational opportunities to healthcare systems struggling to improve." For AAMI, the collaboration helps to heighten its international profile. "Because of their success in working with some of these developing countries, MediSend is becoming well connected internationally," says Ken Maddock, a leader of AAMI’s Technology Management Council (TMC) who also serves on the Medical Advisory Board for MediSend. Maddock was instrumental in bringing together MediSend and AAMI. "It’s like two pieces of a puzzle that fit together perfectly. "A lot of these developing countries don’t have standards or regulatory guidelines or resources, and AAMI has had a goal for a long time to expand its international presence," says Maddock, who is vice president of clinical engineering and telecommunications at Baylor Health Care System in Dallas. MediSend also trains biomedical equipment technicians (BMET) from developing countries in a state-of-the-art training laboratory. The technician candidates are trained to not only install, repair and maintain biomedical equipment but to understand the value of the technology. "The technicians return to their hospitals after six months of intensive biomedical equipment repair training at the Elizabeth Dahan Humanitarian Center, MediSend’s global headquarters in Dallas, to act as change agents in their hospital systems." says Hallack. AAMI and MediSend are also expected to explore how to boost certification internationally. AAMI is the secretariat for the International Certification Commission (ICC), which administers exams for certified biomedical equipment technicians (CBET), laboratory equipment specialists (CLES), and radiology equipment specialists (CRES). "We hope we can collaborate with ICC to develop an international CBET certificate," Hallack says. Hallack envisions other benefits from the AAMI collaboration. "AAMI has the largest community of BMETs in the United States. That is an enormous untapped resource to help us with volunteering, donations, or information," says Hallack. "The collaborative partnership with AAMI will also help to facilitate new relationships and alliances between MediSend and device manufacturers." MediSend International is a global leader and innovator in transforming healthcare systems in developing countries. MediSend is a 501(c)(3) non-profit humanitarian organization with a mission to provide health systems strengthening programs that are specifically designed to meet the needs and challenges of developing country hospitals. Programs include essential professional training and education in biomedical technologies, technical support, the design of biomedical repair laboratories, and the distribution of donated medical supplies, medical equipment and pharmaceuticals. 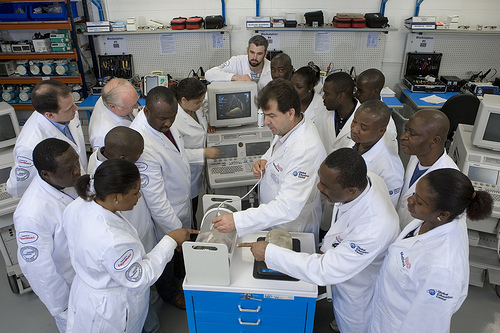 The Association for the Advancement of Medical Instrumentation (AAMI), a nonprofit organization founded in 1967, is a unique alliance of nearly 6,000 members from around the world united by one mission - to increase the understanding and beneficial use of medical instrumentation through effective standards and educational programs, and publications. Biomedical students learn about medical technology through MediSend's various worshops and internships.